Home / Explore the Adventure / Toys / 7 Simple & Easy Ways to Explore the Fun This Summer! 7 Simple & Easy Ways to Explore the Fun This Summer! Summer holidays are upon us, finally. And I couldn’t be more excited. My little lady has left nursery and I must admit it was one milestone that was tough for both of us, but it’s been amazing. Even though it was tough seeing her leave nursery for the last time, I was so happy to see her excited for the next milestone. It may be an end of an era for us but it’s the start of something amazing. However, I can’t take too much time to realise that she’s growing as I have lots adventures and activities to plan for my little explorer. We are going to make these summer holidays count that’s for sure. But with summer fun it’s doesn’t have to always cost the earth, so if you’re looking to avoid pulling out your purse for another adventure park, farm, or zoo perhaps more budget-friendly ideas would be more suited. It’s all about saving those pennies. But what makes this even better is that the whole family will enjoy them, so you'll be spending that all important quality time together. Since starting nursery in September my daughter has become quite the explorer and has become completely fascinated with nature. We have the ultimate stick collection in the bottom of the garden, my coat pockets are full of daisies and my utility room has so many little finds collecting in her explorer bucket. We have pine cones, stones, daisies, feathers, rocks, sticks just to name a few. Both my husband and I love to get into the grips of exploring with her and it even makes me think back to my childhood going on scavengers hunts with my grandparents. So why not give your little ones a magnifying glass and send them on a bug hunt! There are a ton of creepy crawlies all around. To make things educational go to the library and borrow a book or two about bugs. Not forgetting to encourage scientific exploration and introduce your little one to a key scientific tool that is fun and exciting to explore like this GeoSafari My First Microscope. We have been exploring everything from a fairy wand, stones and sticks, you can magnify any flat or dimensional small object up to 8x it’s size, this is a real working microscope designed for kids and perfect for little hands! Let’s go fly a kite, up to the highest height. I love flying kites and if you don't have one it could be fun trying to make one. I have come across some great tutorials from My Best Kite that shows in detail how to make small kites for small children to the larger flying creation for the bigger children. Yes Dads we are talking about you! If not you can pick up some really cheap ones from supermarkets. Rock hunting involves decorating rocks, stones and pebbles, before hiding them for others to find. The stones are decorated using pen or paint, sealed to ensure they aren’t ruined by the rain and then those that find them are able to keep them or hide for someone else to enjoy. We have had some much fun creating some really pretty rocks for other people to find. We are already familiar with rocking, we have been taking part in Norfolk Rocks for some time and the community seems to be getting bigger and bigger. So it was of course super exciting to discover something a little different with Mardles who have their own rock project and it was something we needed to get involved with. So embrace Augmented Reality in the form of these stickers that are sure to bring summer fun to your home in 3D. Well clearly this one had to be on the list. Who doesn’t love to bake? Usually when it comes to baking sweet treats my daughter will sit on the floor entertaining herself with the colander or other kitchen utensils, but now it's time to get her more involved and embrace the whole baking idea with her. Now I must admit, it's not easy and they will get messy so you have been warned. However before you embark on a little baking session with little ones that have to be well equipped, as we all know how messy little ones can get so what better way to get in the mood for a little bake off than with this adorable personalised apron from Gift Pup. This apron was a little too big for her but we have a special way to make it fit and doesn’t she look cute? This apron is a gorgeous lilac pink and is made from polyester canvas material and I know it’s going to stand the test of time. 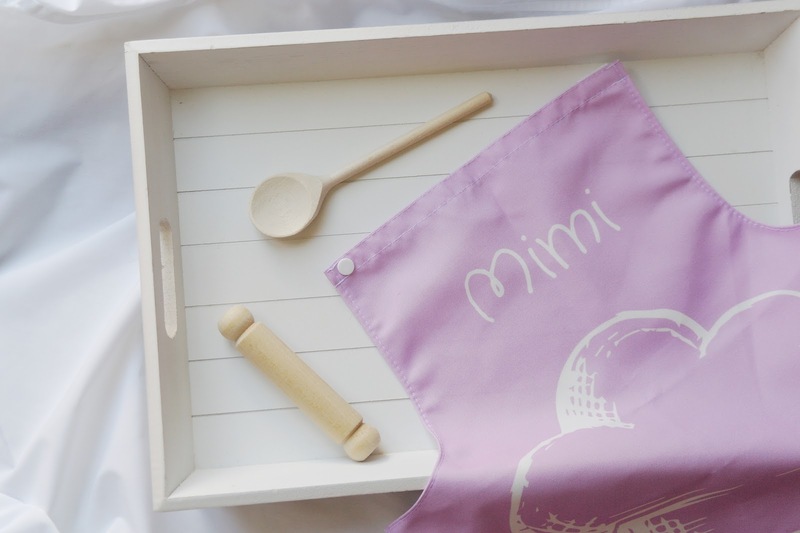 These little aprons can be personalised with their name up to 15 characters. A great way to encourage your little ones to get into baking or cooking, they will be master chefs in no time. Roller-skating together is such a fun and healthy way to spend time together as a family. 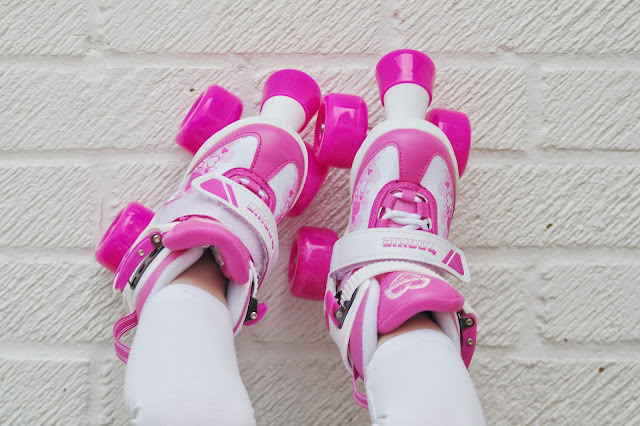 I remember spending so many weekends with my parents, brother and sister at roller skating places when we we younger. We had so much fun as a family and of course there were a few bumps along the way too. And so I wanted to have just as much fun with my daughter. However watching a four year old in skates for the first time is the best thing ever, I don't think me or my daughter have ever laughed so much. But all jokes aside, getting my little lady skates has been something that I have been wanting to do for some time. This is one you all must do. It is always a good idea to try and encourage little ones to be creative because it is a great way for them to become expressive by using their imagination. When little ones are creative they can try new exciting things and will therefore learn new ways of being - whether this is through the magic of play dough, the noise of saucepans lids or even through messy play they will soon be excited to try and become more expressive. Even though it’s the summer holidays, always take the opportunity for some summer learning. Over the last few weeks my husband and I have been getting our daughter some activity books and some learning cards for preparations and so far they have gone down really well. We are doing great with colours, identifying different animals, transport and every day objects, number and letters. However books are also great for the letting their imagination run wild too and without fail every night we will always read together, it's her favourite thing to do before bedtime. My daughter is completely obsessed princesses, she even likes to think of herself as a Rapunzel so during the summer we wanted to get her something that I know she would love but more importantly have that magical touch. Disney. A love for Disney is something that never really goes away, if anything it grows. Whenever I think about Disney it takes me back to my childhood and the fond memories of love, magic and fairy tales. Now that I have my own daughter I want the magic to continue.. At three years old she knows a thing or two about being a Disney fan as we are making our way through the collection of classics. My daughter is in complete awe of the Disney princesses, one in particular is by far her favourite. Princess Rapunzel! But seriously who doesn't love Disney though? 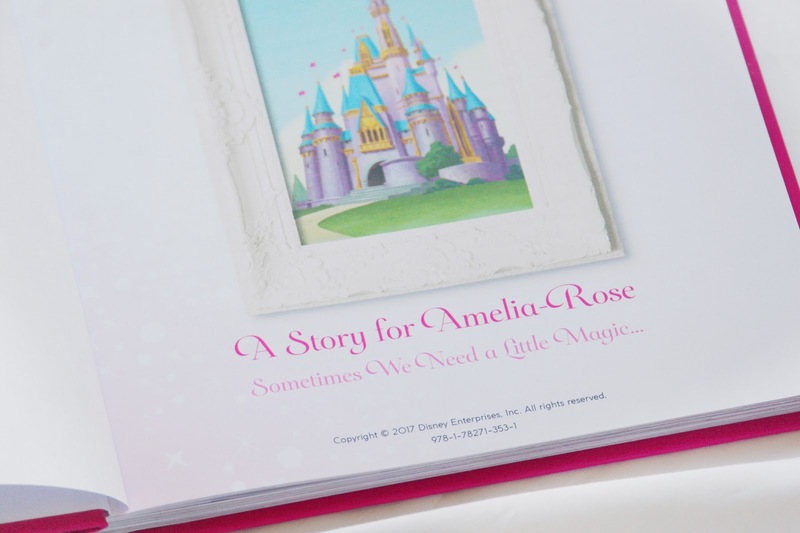 So a great way to explore the fun during the summer than with a Personalised Disney Princess Book from I Just Love It. 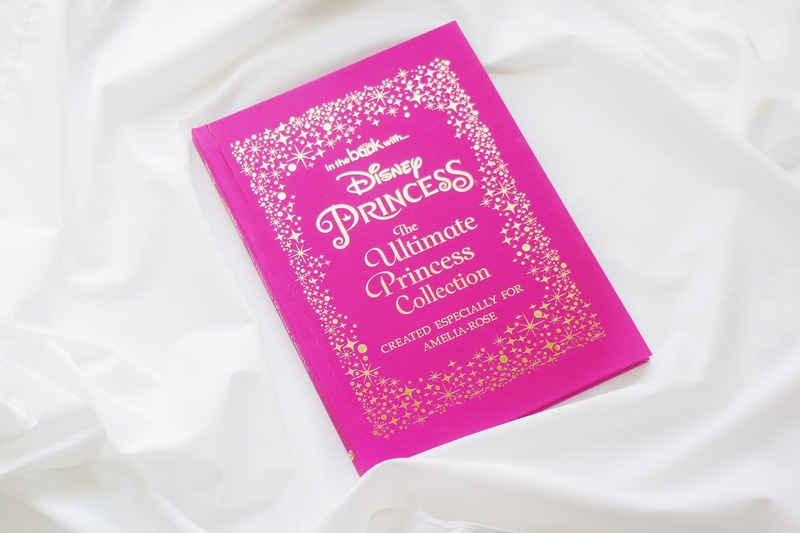 All Official Disney Princesses feature in this mesmerising personalised edition, with the recipient’s name beautifully embossed on the cover of the book, and space for a special message on the inside page. The recipient’s name is even magically weaved into the top of each page, and the entire book is presented in a free gift box. So there you have it 7 simple and easy ways to explore the fun this summer that don't cost the earth. So go and make memories. 30 comments on "7 Simple & Easy Ways to Explore the Fun This Summer! " Some of my fave memories of summers as a kid was licking the bowl after baking with my mum and sisters. We were always outside having picnics and going for adventures! As a kid? I do it now. My favourite summer memories from when I was a kid were always outdoors! I can't believe I've never flown a kite with Ru, he would love that! Our first one was £1 and stay up for all of 2 sec so make sure you spend more than £1 ha. Yes, Roller Skating is so much fun. My boyfriend is 27 and still insists on licking the bowl when I have baked a cake! It's not till you have children yourself that you realise how many childhood memories you have doing small things! Haha how funny. But I don't blame him. Great post! Emelia has been nagging me for ages to get her some roller-skates! I've got them on a Christmas list for her, but she might end up with some to try over the summer! Fantastic ideas for keeping the kids entertained over summer. We love rocking and have had lots of fun doing it so far this summer. Amazing ideas! We love baking but with a toddler I always have to work myself up!! Ahhhh fly a kite, one to add to our bucket list for a windy day. We flew a kite for the first time this year! Great ideas! Baking is the best of fun. Messy, but fun.